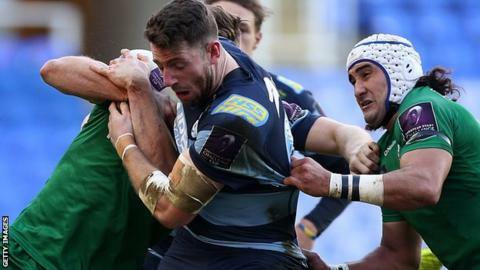 London Irish inflicted a first ever European Challenge Cup loss on Cardiff to move top of Pool One. Blues centre Cory Allen scored the first try, crossing after some expansive back play. Irish winger Andrew Fenby went over in each half and fly-half Shane Geraghty charged down Gareth Anscombe's kick to score under the posts. Fenby secured the win after the Welsh side failed to deal with a kick-off, to put Irish top of the group. An early Tom Homer penalty gave Irish the lead, but the Blues responded not long after with centre Allen rounding off a free flowing move from full-back Adam Thomas' inside pass. After a couple more Homer penalties, Geraghty's initial break to Topsy Ojo very nearly sent him over, but after it was recycled quickly Fenby crossed to extend Irish's lead. Fly-half Anscombe got Cardiff back into the game with two penalties with half-time approaching, but after the break his opposite number Geraghty charged down his attempt and collected to score his side's second try. Welsh winger Fenby scored his second try of the afternoon, pouncing after the Blues let the ball bounce from a restart to race away, before Anscombe gave his side some impetus towards the end after he went over. Despite the return of Wales captain Sam Warburton the Blues struggled to create in the second-half with Irish's pack on top, especially at scrum time. London Irish: Homer; Ojo, Griffin, Sheridan, Fenby; Geraghty, Steele; Court, Paice, Cross, George (capt), Low, Sinclair, Cowan, Narraway. Replacements: Palframan, Halavatau, Aulika, Cox, Gilsenan, Allinson, Noakes, Lewington. Cardiff Blues: Thomas; Cuthbert, Allen, Evans, Smith; Anscombe, Williams; Jenkins, Rees (capt), Jones; Paulo, Turnbull; Cook, Warburton, Navidi. Replacements: Dacey, Hobbs, Mitchell, Jenkins, Vosawai, Jones, Davies, Fish.